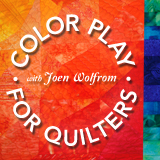 Joen Wolfrom’s A GARDEN PARTY OF QUILTS: 7 PIECED PROJECTS FOR FLOWER LOVERS comes from a color expert who shows how to blend flowers into quilt designs, from tulips to clematis and more. Seven flower quilt projects demonstrate the techniques, using flowers which are completely machine pieced and presenting projects for all skills levels. Step-by-step instructions on piecing, patterns, and color illustrations of everything make it easy to understand how the projects are put together.